I have so many Angels in my life that I have lost count. I have outlived the few Demons that I had in my life. I wonder what prompted young Pravin to come up with this topic for the weekly LBC blog post! You can see what he and the other writers of the LBC have to say in their respective blogs. Maria, Pravin, Ashok and Shackman. This entry was posted in Blogging, Humor. Bookmark the permalink. 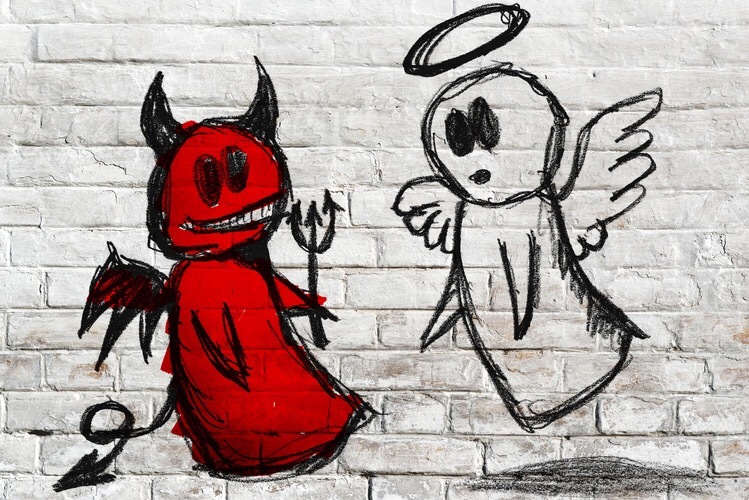 18 Responses to Angels And Demons. Maybe he likes Dan Brown novels. Or not. I took it as a metaphor for decisions and choices we make in life. Yes, I read your post and have commented there. Pravin who I know personally is an enigma. Quite how his mind works is a mystery to me. So glad there are more angels than demons in your life! May that always be so! I think it is up to us to live our lives in such a way that angels always feel at home, and demons know they are not welcome! I have a nasty suspicion that demons consider me as competition! Well, both angels and demons are mythical (or maybe metaphorical) creatures. 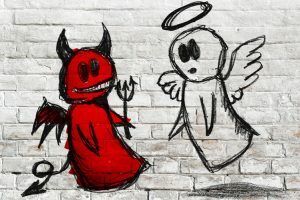 I’ve met a few Demons in my life but no Angels – nobody is that pure or innocent or unfailingly good. I think the Angels must be forbidden to leave Heaven and mix with ordinary earthlings. My understanding is slightly different. There can be grey in beings, but by and large they are unimportant in our life’s journey. The demons and angels come for a purpose and it is up to us to recognise and treat them for what they are. I’m surrounded by angels…both here and beyond. Demons? Not so much. Maybe distraction is my demon that I still keep around. I’m prone to love it but I don’t love what it does in my life. Yes, from your blog posts I too think so. We have that in common. Life is good here too! You have very interesting people in your life Cathy and I like the way you slot them into various categories! In my book (being of an atheistic bent) people have both angelic and devilish potential. I’ve met many who were an angel to me in a particular situation and others who were a devil. Secret Agent Woman recently posted..Other times, it’s a run of funny things. People would be surprised to know that Angels and demons can be the same. There is a passage in the Book of Joshua that suggests this same notion: Joshua asks the messenger whether he comes for the Nation of Israel or for their enemies, the messenger answers “No, but this time I come as the Captain of the Hosts of the Lord”. What people usually consider demons are, in truth, trapped and angry souls that refuse going to the light. But this is a very complex matter and alas I lack the time to discuss it now. Thank you for this post of yours, it made my mind produce a lot of thoughts. In the Indian tradition too, they are treated as different rather than as one being good and the other bad. It is also used as metaphoric explanations of inner conflicts of all humans. Rummy, yet another similarity between our two cultures :). And I agree, they can also be metaphoric explanations of human inner conflicts.